What can you do with a cardboard box? Plenty! 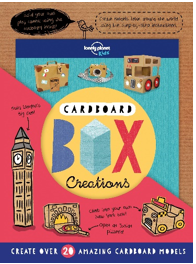 No longer destined for the bin, Cardboard Box Creations shows children how to turn these scraps into amazing, cutting-edge designs, from a hot air balloon and space rocket to a Chinese dragon and Tiki totem pole. The book includes not only step-by-step instructions, but also a cardboard starter kit embedded in the cover. 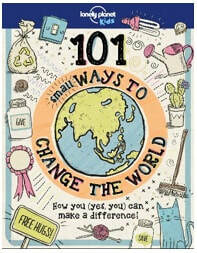 Written by award-winning author Aubre Andrus, 101 Small Ways to Change the World shows how you’re never too young to make a big difference. A practical, fun and creative book to inspire you at home, school and in your local community, it includes random acts of kindness, craft projects, energy-saving ideas and much more. It’s New York, London, and Paris – but not as you know them. These unofficial guides help LEGO® fans of all ages discover and create Central Park, the Eiffel Tower, the Houses of Parliament and other iconic landmarks in brick! For adults and children alike, our new Brick City series brings each city to life and is sure to inspire you to get building. Get ready for a walking tour like no other – all from the comfort of your sofa! These seriously streetwise guides are packed with themed trails, from food and festivals to music, art and sport that reveal amazing facts and intriguing tales you won’t find on the usual tourist routes. Join Lonely Planet explorers Marco and Amelia as they hunt for more secrets, stories and surprises in another of the world’s great cities. You’ll discover human pyramids, dancing eggs, a witch school, and lots more!